Pieces of Granite by Brenda S Anderson is a contemporary Christian novel. It deals with everyday situations as well as extraordinary ones, showing that in all circumstances of life, we must remember to fix our eyes on Jesus. When life gets too hard to stand – kneel and pray. And when life is good – kneel and pray. Debbie is the perfect wife, daughter, sister and mother. She seems to have it all together. She is the glue that binds her extended family together, but Debbie is not perfect and in trying to be all things to all people and in being self sufficient, she has forgotten about grace. Life is not meant to be led with us in control, but it is to be led in partnership with God. Without Him, sooner or later, we will crumble. Within Pieces Of Granite is the subject of Down’s Syndrome. Debbie, following an amniocentesis finds that baby Lilly has Downs. Debbie knows that “God doesn’t make mistakes.” She is horrified at some of the comments she receives. Every baby is planned by God and they are all perfect in His eyes. Pieces of Granite has the twin themes of fear and worry. Debbie’s husband Jerry has already lost his first wife following the death of their baby Christopher who also had Downs (before the novel opened). Jerry is riddled with worry and fear that history will repeat itself. Jerry forgets about God. He locks his fears away and in doing so, inadvertedly locks up his heart. Brenda Anderson shows the damage that this can inflict both on the individual and those closest to him. Far from protecting from hurt, the hurt radiates out. Two contrasting lifestyles are revealed in the novel. Debbie and Jerry and most of their extended family live in rural Minnesota and are God believing. In contrast to Debbie’s brother Ricky is a New York businessman. Ricky used to have a faith in his teens but has let life separate him from God but “Richard frequently heard God’s call. God refused to let him go.” Once we have given our lives to God, even though we may walk away from Him, He will never walk away from us. Ricky is a workaholic, seeking the next high within his job. Work drives him but he will never be satisfied “that glee was swallowed up by a desire to reach an even higher status.” Work produces a temporary high compared with the fulfilment one gets in living a life for God. A strong message that emerges from the novel is to praise God in the storm. “With the direction their lives were going, how could Debbie possibly be in the mood to praise?” When life is good, we are to praise God. When life is tough, praising God lifts our eyes off the situation and onto God, from whom we will get our strength. Love and hate are closely related. If we love someone deeply and they hurt us, if we do not seek God, there is the potential to hate deeply. “How could she love him yet despise him so deeply?” Tied in to this is the theme of forgiveness. If someone has hurt us, we must forgive or a rift will develop that will damage us. In our hurt we must remember God’s grace and extend it to others. I love Brenda Anderson’s writings. This is the second time I have read Pieces of Granite and I got even more out of it this time around. Brenda Anderson writes fabulous stories that honour God. She is not afraid to tackle hard issues with sensitivity. Her characters are easy to empathise with. Their struggles are struggles that each and everyone of us may face at sometime in our lives or know someone who will. Keep on writing Brenda, I love your stories. 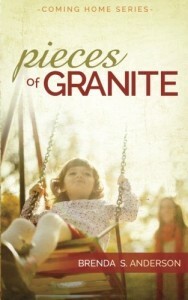 Download a copy of Pieces of Granite today. It’s the prequel to the Coming Home series, you will be glad you did. Thank you, Julia, for this very gracious review! I admit I did a little Snoopy Dance when I read it. 🙂 Thank you for reading my stories and helping spread the word!